I don’t drink coffee in Paris. Why should I? It’s expensive and mostly bad and the waiters are often surly and unfriendly. No self-respecting coffee drinker should have to subject themselves to overpriced Parisian sludge served with a sneer. I long ago gave up on the idea of great coffee in a sunny café by the Seine, and content myself to home brewed beans, leaving cappuccinos and friendly cafes for Italy. Happily, changes are taking place in Paris. Just as the artisanal baguette was reborn after a long period of low quality bread on the Parisian bakery scene and interesting types of non Lipton tea are popping up in shops and cafes around the city, all of a sudden good, even great, coffee has arrived and a pro-artisanal coffee movement is on the rise, albeit only in a select few Parisian spots. A young breed of — often foreign and mainly male — baristas who believe in their product and technique, and are eager to share their passion, are helping to open up the Parisian coffee scene to amateurs and seasoned coffee pros alike. Their excitement is catchy and the new Frog Fight barista competition is quite the hit. I am certainly no coffee expert and do not claim to know or understand all of the innovative new techniques that are currently on the market (from fancy espresso machines to the cold-drip and the elusive coffee siphon pot), but I do know what I like, and that is quality coffee and thickly foamed cappuccinos made with fresh milk. 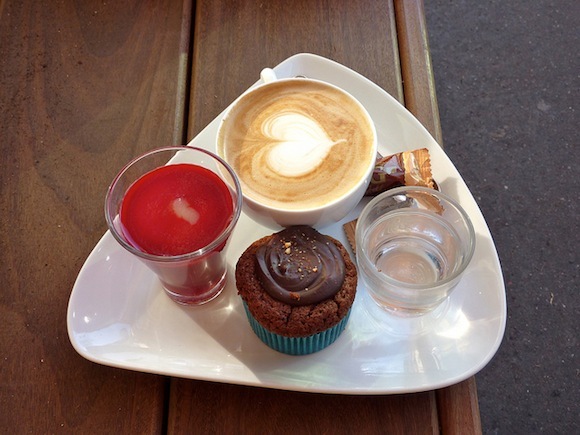 After some very pleasant sampling, I am happy to present my 5 top Parisian coffee spots. All use fresh milk and either torrefy sur place or buy their beans freshly and locally roasted. 1. 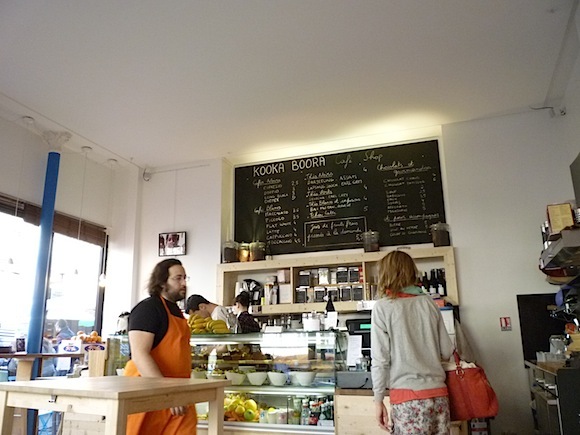 Kooka Boora – One can not be in a hurry or on a budget in this uber trendy 6 month old café in the 9th SOPI area behind Pigalle. Regulars line up for the 10 am weekend/ 8:30 am week day opening and patiently wait while the barista crafts a perfect brew. The thick foam on my wonderful cappuccino was definitely worth the wait! Don’t miss the terrace for sunny days to come. Rose Bakery is just down the street, a perfect combination. 2. 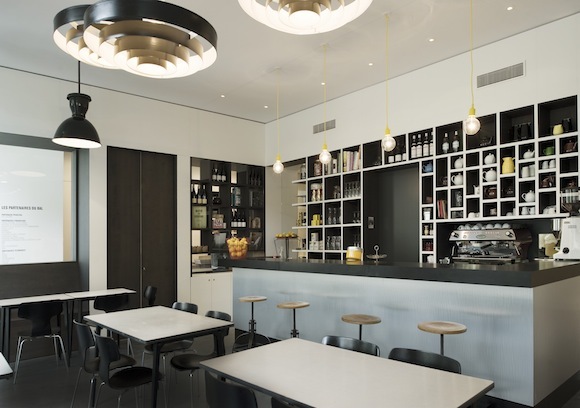 Coutume Café – The new baby on the Paris coffee scene and host of last week’s Frog Fight this 5 week old café is located behind the Bon Marché in the chic 7th. Run by partners Tom Clark and Antoine Netien it is a hip and happening spot to have a morning brew, tasty lunch or a weekend brunch. Many exciting things are on the way at Coutume Café — from new machines, larger in-house torrefaction for roasting up to 12 kilos at once, barista and roasting courses, coffee cupping (tasting, pairing, inhaling), art exhibitions to homemade baked goods and hopefully more Frog Fight competitions. This innovative café uses not only a high quality espresso machine, but also the syphon Hario, conical drip, and cold-extraction techniques to make the perfect cup of coffee. I stopped by for a cappuccino and a chat with Tom the other day. His positive energy and excitement was catchy and his cappuccino delicate and delicious. Despite some friendly rivalry in the Frog Fights, Tom feels the new breed of coffee shops have mainly banded together to help push forward the coffee culture they love and want to share. A goal? Create a movement to unite against the big monopolies and push specialty coffee into the city of light. The challenge is that, when it comes to coffee culture, the French seem to favor functionality over actual enjoyment of coffee. 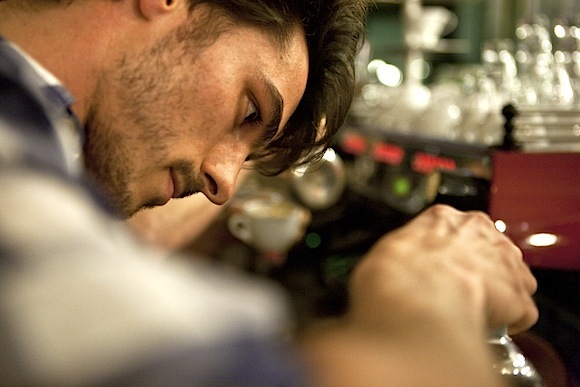 His hope for the Parisian coffee scene is to integrate an amazing product into the culture and to never sell out. 3. Espresso and Ristretto – I stumbled upon this hidden gem of a café on one of my infrequent forays into the 11th . A tiny spot on the rue de Charenton behind the Place de la Bastille, this unassuming cafe caught my eye and pulled me in. Owned by the friendly barista Arnaud Laroche and assisted by Leigh, an America barista from Seattle, this petit café that has been around for over a year and a half and my latte macchiato was one of my best Parisian coffee experiences yet. All of Arnaud’s beans are picked up at le Havre, torrefied in house and for sale sur place. For Arnaud, the challenge is to get the French to change their habits and understand real coffee at the right temperature. He dreams of a larger café with outdoor tables…. A suivre! 4. Caféothèque – With their opening in 2007, Caféothèque is the oldest on the new Paris coffee scene. This tiny, well respected, spot on the quai by the Hotel de Ville was the first to start this serious coffee movement by truly embracing artisanal coffee for Parisians. 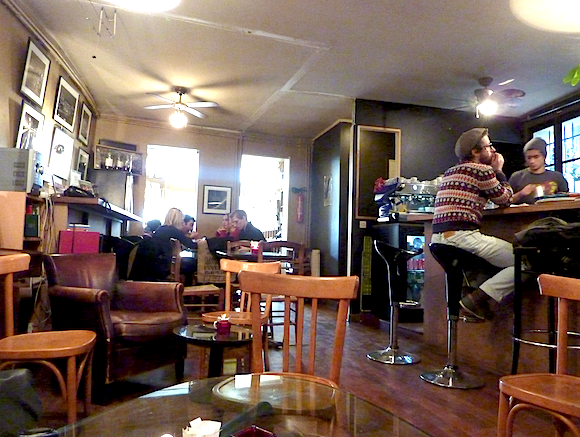 They brew, torrefy and sell beans in this cute comfy and unassuming space. 5. Le Bal Café – This cool, trendy, and well hidden café is an arty foodie haven tucked down a mellow dead-end street behind the busy Place de Clichy. In business since Sept 2010, they have combined great coffee, fresh lovely food, carefully selected wine (with former Rose Bakery and St John’s Bread and Wine chefs in the kitchen and two former Willi’s Wine Bar staffers out front), with modern art (art bookstore and gallery attached) to create an ultra original and super comfy space. I can’t wait to come back and try the incredibly yummy looking brunch and hang on the sunny terrace. Let us know your favorite Parisian coffee spots. Where have you had a great cappuccino or espresso in the city of light? What have I missed? 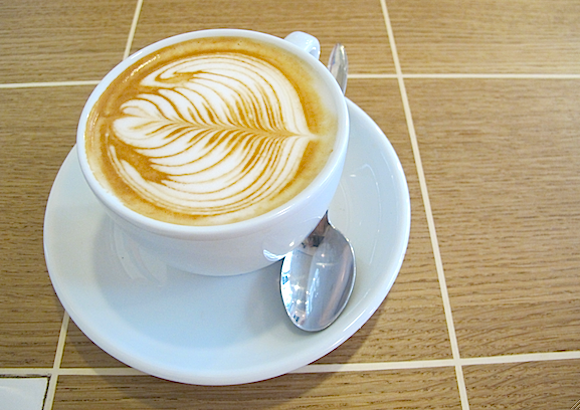 More on the best coffee in Paris. Vingt Paris on Coutume Cafe. Buy your freshly torrefied beans at Cafe Lomi. 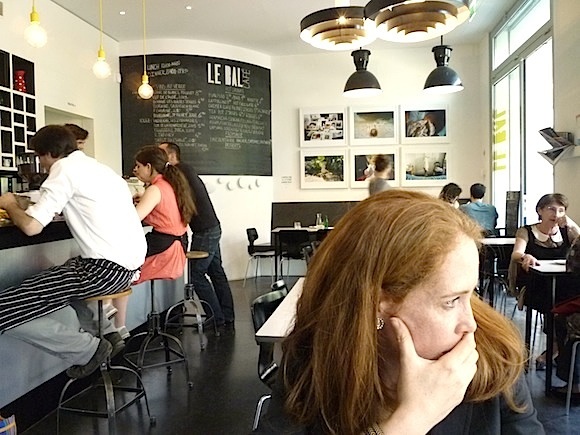 Barbara Austin discovers Le Bal Cafe and Restaurant for Girl’s Guide to Paris. Written by Erica Berman for the Hip Paris Blog. For our amazing rentals in Paris, Provence & Tuscany check out our website Haven in Paris. I will definitely try 2 places. Yesterday I refused to pay 5 euro on a bad coffee cup, it was a nice fancy place but to push a bottom and use long life milk and call it latte or cappuccino made me so mad. I told them that it’s not coffee and changed it to something else. it appears ‘merce and the muse’ has closed down as well. any other chance for a decent cup of coffee in the republique area? i am here for a week on business and don’t know how to survive without good coffee. Are you sure that cappuccino from Kooka Boora wasn’t actually the legendary Autralian “Flat White” which I have read somewhere has been introduced through KB to Paris? Looking forward to trying our their brew when we are there in May 2013. I love that coffeeshops have hit Paris. Enfin! I’m so excited my hotel is about a 10 mins walk from Coutume Cafe and I’m an Aussie so will definitely go and try it out! Thank you for all the comments. I have learned that expresso and ristretto has since closed. Also, new and delicious on the block is Telescope cafe. A suivre. Greg, thank you for your comments. As to Kooka Boora, it is for those with patience as the wait is long …. this is a serious affair. It is funny going there after spending 6 weeks in Italy where a cappuccino takes 1 minute to make, 1 minute to drink and costs 1€20-1€50 sitting or standing. I have worked with & or visited these cafes and I would say your list is bang on!! How ever I would also drop one or two off this list and just visit Kooka Boora twice as what they are doing is so commercially unviable and so beautiful. Love the bustle of domestic oven baking going on in the background and th evasion of the staff AND in this case the owner. Watch the top two for real day to day quality beyond meaningless trophies, they will go far. Haha how can you write this title when it’s impossible to find good coffee in the US….. I did not see my favorite cafe listed merce and the muse Located at 1 bis rue Dupuis 75003 Paris. very good cafe and pastries. A woman after my own caffeinated heart! Why do the Parisians get coffee so wrong when Italy is just RIGHT THERE? But you’re right…there are a few great places now — you listed all of my favorites — I’d also add Merce and the Muse to the list. Let’s go for a coffee together when I’m back from Texas! Correction to my last post… it appears I have found it… Coutume Café, possibly the best coffee in Paris! Fabulous post and list of places! We are visiting this summer and beyond thrilled to see there ARE artisan coffee places in Paris beyond what we *enjoyed* on our last trip! Thrilled! Does anyone have any recommendations for coffee in Geneva? What is the key to getting half & Half or cream with your coffee in Paris, instead of milk? I made a google map of the good places to drink espresso in Paris, here. thanks a lot for an answer!!! I would try calling them to ask as things change quickly. I have not seen rice or almond milk on the Paris scene yet . . . Besides Pozetto, I had a perfect Illy at Emporio Armani Caffè 149, bd Saint Germain in the 6th arr. 2 euros al banco! Besides Pozetto, I had a perfect Illy at Emporium Caffè 149, bd Saint Germain in the 6th arr. 2 euros al banco! As an Italian I agree with crazywaiter and Erica: Best coffee in town by far is Pozzetto in the Marais (www.pozzetto.biz). I do not find it expensive though, as a proper Italian espresso, in hot ceramic cup filled halfway, often accompanied with some treats as mini-gianduiotti or amaretti there is 1.50 vs. this world’s Starcoffees’ soupydishwashery liquids @ 1.90. I have to say..cafe gourmandt..I fell in love with it the first time I tasted one!! !And now of course here’s a picture of one..I started laughing with pure joy when I saw the picture-it bring’s out memories!!! Hi Matthew. Thanks for letting us all know about Eggs and Co. I have been there and you are correct, he makes great expresso. I went after I wrote the article and also, have not yet tried his cappuccino. Next time! This guy makes a really nice shot of espresso: http://www.eggsandco.fr/ We found it today while wandering around. No frills and very good. i’m here on vacation from san francisco. as you know, we have gourmet coffee shops everywhere and we are very picky about our coffee’s. when i came to paris i was a bit culture shocked and deprived that there wasn’t a coffee house that i could easily find for a cappucino. glad to see it picking up and i will make it to one or all of these while i’m here. thank you! It is wonderful but cher! You won’t have better coffee (espresso) in Paris than at Pozzetto 39, rue du Roi de Sicile !!! Had I known about these places when I was in Paris late last year I would have tried every one of them. At least now I know for next time! I did, however, find the coffee at the Alto Coffee carts superb. Real coffee made my someone that knows how to use an espresso machine. There are two carts just outside Galeries Lafayette, near Opera. So good to know! There is no way I can survive without at least one strong espresso a day! AT LAST Coutume is open! I used to walk past the place every day on the way to uni during the construction and remember the temporary hole-in-the-wall espresso tastings. Can’t wait to go back to Paris and see the place open. 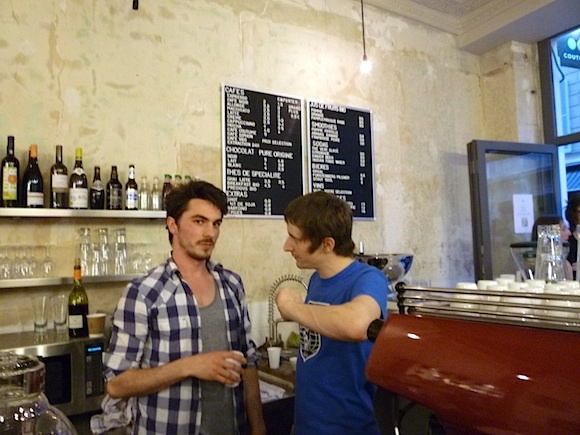 Let it and la Cafeotheque open Parisians’ eyes to good coffee! Merce and the Muse – super funky but needs a passion injection into its coffee making. You can’t make a good coffee if you aren’t totally mad about it! What a great discovery to read this post! I have been suffering in Paris from the TERRIBLE coffee- it’s been over a year since I’ve drunk a real latte so am definitely checking this place out. Thank you! That’s funny, I never drank coffee until I started going to Paris. The Cafe au Lait at Laduree was perfect…I’m forever trying to emulate it. Can’t wait to check out all of the new places. I think I am just so numb to the quality of coffee when I am there…I just float around in a blissful state. However, I have heard the same complaint from others, and next time I will try one these shops! Love the images of the coffee bar’s! Very alive and real – just simply good. Great post! Clearly there’s a lot I still have to try! I’m not even a coffee drinker and I want to go to these places. They just look so cozy and awesome. Thanks for sharing your finds! Great post! I would definitely try some of them when I visit in Spring! Having just returned from Italy, this is EXACTLY the post I needed, thank you! Can’t wait to try these coffee spots and compare them with the ‘real thing’ (aka an Italian cappuccino). I have only been to Caféothèque thus far, and loved it! Can it be true?! This is a dream! This is pure heaven! I cannot wait to check all of these places out! Paris and Coffee! Finally. Together. I’m not interested in coffee but I might change my mind just to look at that splendid profile in picture #2. Hi Terry, which one are you? And thanks for the tip on the hours at Kooka Boora. Kooka Boora now opens at 8h30 in the week. ps, I don’t know how, but I ended up in one of the pics. merce and the muse should be on this list, and le dauphin — although not a coffee shop — also makes really good espressos. if youre there at night, have one before leaving.